On a gloomy Friday morning, analytics enthusiasts gathered at the Wharton School for the Wharton Analytics Accelerator Summit. 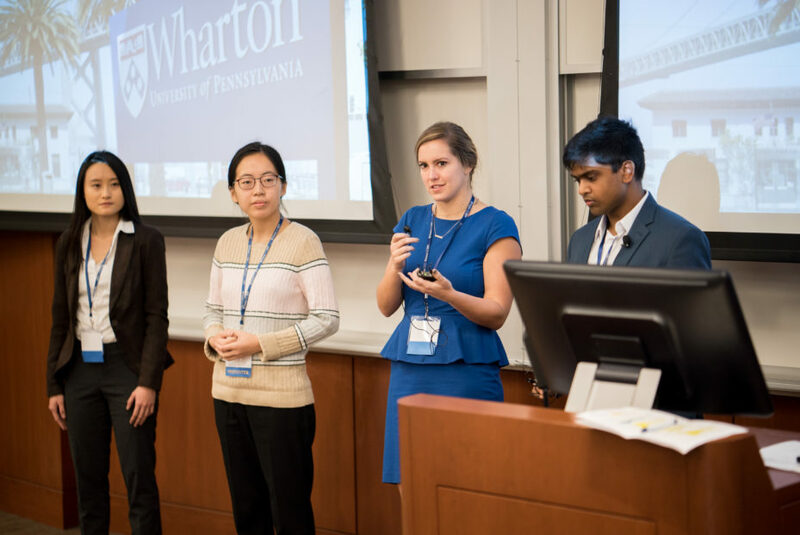 Now in its second year, the Analytics Accelerator, a program of the Wharton Customer Analytics Initiative, once again paired student teams with corporate partners to solve real problems with analytical solutions. The program is competitive — only 24 students were chosen out of 200 applicants. Similarly, four companies were chosen out of the 30 that requested to partner with WCAI: the Barnes Foundation, Fuel Cycle, Hachette Book Group, and Reed Smith. To kick off the Accelerator, the students were split into teams and given four weeks to work with the data sets provided by the organizations. 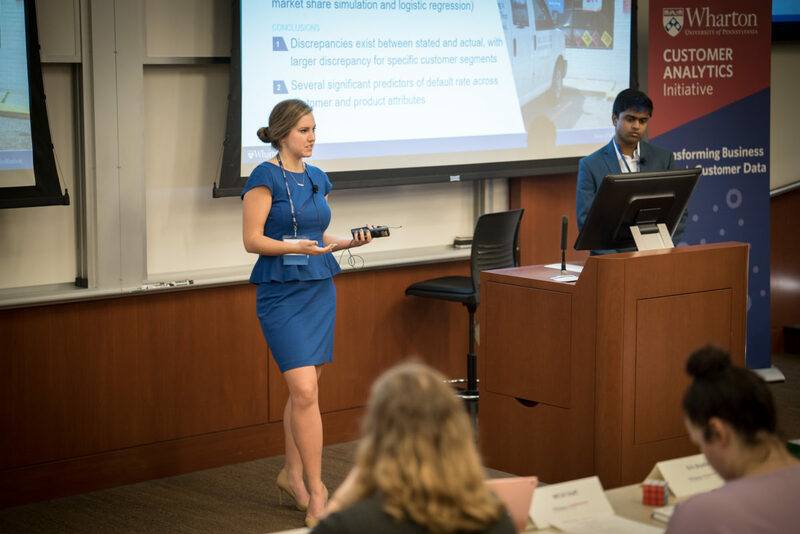 Their hard work culminated with the final Summit, where they presented their findings to an audience of corporate partners, students, and other analytics enthusiasts. The four companies featured this year spanned a range of industries, operating in the arts, publishing, market research, and the legal sector. 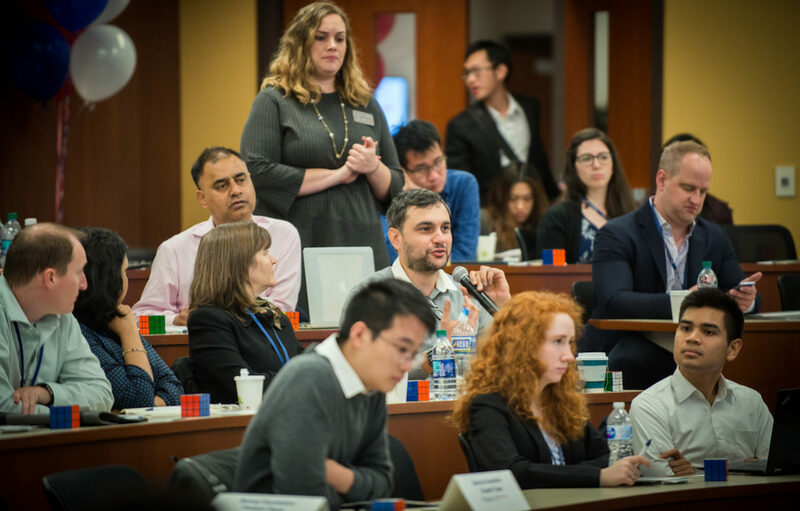 The participating students were equally diverse, coming from undergraduate, MBA, and even post-doc levels and across Penn’s numerous academic departments. The Accelerator Challenge is designed to be a well-rounded and immersive learning experience. Students not only had to show exceptional modeling and statistical analysis skills but also present their work to an audience with varying levels of experience in analytics and statistical methods. In addition, the students had to balance this with their classes and other extracurricular activities at Penn. Kelly Herring, WG’20, was part of the team that partnered with market research firm Fuel Cycle to work with data provided by their client Rent-A-Center. “In the real world, work is everyone’s clear first priority, whereas here [at Penn] folks have schoolwork and extracurriculars. This adds another interesting challenge to teamwork, because you’re trying to work around so many schedules and competing priorities and still ensure there’s a quality product. So I really appreciated the team’s willingness to make time for this and really crank when needed,” she said. The Fuel Cycle/Rent-a-Center team answering questions from the audience. Since the datasets that students used came directly from the participating companies, teams had to manage all the issues that arose when using data collected by companies at various times using different methodologies. In some cases, this meant that some data was missing or multiple different datasets that had to be merged and standardized. For Kelly and her team, the data they were given posed many challenges that they had to circumnavigate. They had multiple different datasets and had to decide which fields should be merged and which ones they could discard as irrelevant to their analysis. “Our team had to think very carefully about exactly which analyses we wanted to do and what the goal was, so we could be sure to include all necessary data fields,” she said. The lack of perfect data pushed Kelly’s team to come up with ways to get more out of what they were given. This, she says, was similar to what she has done in previous professional settings. The Accelerator was not only an exercise in data analytics but in agile teamwork. Since teams were put together by the organizers, the students had to get to know their group members quickly. Since participating students came from across Penn’s schools and from various degree levels, they also had to leverage their individual strengths to create optimal models and solutions and give well-crafted presentations. The Accelerator is not designed to be a competition. The impact of the models that the student teams built remains to be seen as the partner companies put them into use and observe the results over the next several months. Meanwhile, the students walked away with valuable experience that will help them succeed in their future careers.